Small: 7.5 in H x 4.5 in W x 1.25 in L, 2 lbs, PN# KL21. The Kiss Man and Woman Hugging Statue by Gustav Klimt. The powerful bond between man and woman (c. 1907) is eloquently illustrated by the renowned 20th-century artist,Gustav Klimt, in his famous painting ofThe Kiss. Jay Bakari Allen Lithograph Art Print On Canvas "SENSUOUS WHISPER"
You are purchasing a Lithograph Reproduction Painting on Canvas by Renowned Artist Jay Bakari Allen Entitled: "SENSUOUS WHISPER", Image measures: 20"x24", a hairline flaw on image (refer to photo slide), other than that art is in very good condition. Stylish Frame has gold color finish with soft white material trim, it measures: 26.5"x29". 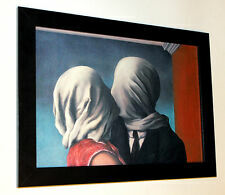 This art Print is the perfect gift for lovers. Thanks again for your consideration and potential purchase at Joe's Quality Values. Good Fortunes!!!! Victorian Lithograph Print Picture Spinning The Wheel Of Love Children 8" X 10"
Up for your consideration is a reproduction turn of the century stone lithograph Victorian print. The print is perfect. Style: Victorian. Original/Reproduction: Artwork Reproduction. Your patience is appreciated. FINE ART REPRODUCTION PAPER SUITABLE FOR FRAMING. PAPER SIZE 14" X 11". IMAGE SIZE 12" X 9". Victorian Lithograph Print Picture "Sweethearts" Children Kids In Love 5" X 7"
Chinese Papercuts -- Small Set These paper cuts are all handmade in China, where paper cutting has been a traditional folk art dating back to 105 A.D. The pictures are carved from special, tissue-thin rice paper, then hand-painted with bright Chinese ink. They are cut out in the inside as well the edges and thus stand-out against any background. Each motif is an unbroken, continuous piece. These paper cuts can be used to create greeting cards, decorate photo albums, make bookmarks or design a poster. Each set of paper cut has its own special design. Chinese Paper Cuts -- Large Piece (Zhou) These paper cuts are all handmade in China, where paper cutting has been a traditional folk art dating back to 105 A.D. The pictures are carved from special, tissue-thin rice paper, then hand-painted with bright Chinese ink. They are cut out in the inside as well the edges and thus stand-out against any background. Each motif is an unbroken, continuous piece. These paper cuts can be used to create greeting cards, decorate photo albums, make bookmarks or design a poster. Each set of paper cut has its own special design. Title: 10 lovely cats Size: 57 x 26 cm (22.4 x 10. This print painting will be sold. phone number when you buy the item. We do try respond as quickly as possible by 12 hrs. The Kiss, by Gustav Klimt, is a famous and rather singular composition of a couple kissing. It was painted recently, so it will last for many generations of artistic appreciation. It is interesting to note that the artist painted a close representation of himself in his painting. Vintage Art Print I Love Lucy Ricky Framed Artist Wang Haiyan Signed 23.5"
Signed by Artist Wang Haiyan. This retired, out-of-print Haiyan is one of several from a collectors estate. Keith Haring - "KH11". KEITH HARING BIOGRAPHY However, Haring's art career was short-lived. The artist fell victim to the growing AIDS epidemic and died on February 16, 1990 at the age of 31. But before he died he used his art to give voice to those who were dying from the disease. Skull with Burning Cigarette Vincent van Gogh canvas print framed 12,8"x16,7"
Keith Haring - "KH16". The third eye refers to the gate that leads to inner realms and spaces of higher consciousness. KEITH HARING BIOGRAPHY Hobnobbing with celebrity artists like Warhol, Basquiat, and Madonna Haring was able to use his own growing celebrity status and break through internationally, traveling as far as Australia and Rio de Janeiro and painting large-scale murals in those countries' public spaces. WE BELIEVE ALL ISSUES CAN BE RESOLVED IN A CORDIAL WAY. WE WILL RESPOND TO YOU WITHIN 24HRS. It was created recently and will thus endure for many generations. You will find three images above. The first is the painting itself, and the second is a detailed close up of a small area that illustrates the brush strokes and the texture of the paint and canvas. Keith Haring - "KH03". KEITH HARING BIOGRAPHY Hobnobbing with celebrity artists like Warhol, Basquiat, and Madonna Haring was able to use his own growing celebrity status and break through internationally, traveling as far as Australia and Rio de Janeiro and painting large-scale murals in those countries' public spaces. Alekos Fassianos. Colour Offset Lithograph Print. Color print - Offset Lithograph onpaper. LOVERS RED WOMAN & BLUE MAN. Reproduction from a painting. Open Edition of only 500 printed. Directly from my Personal Collection. Keith Haring - "KH03". Published as part of the Keith Haring Collection. KEITH HARING BIOGRAPHY Hobnobbing with celebrity artists like Warhol, Basquiat, and Madonna Haring was able to use his own growing celebrity status and break through internationally, traveling as far as Australia and Rio de Janeiro and painting large-scale murals in those countries' public spaces. Chantilly Lace. Actually this floral was painted a. “Chantilly Lace” was titled after a. favorite art show arena in Chantilly, Va. The original went to a collector in Washington D. C. His watercolor, on first. After George Morland . Hand Coloured Engraving. by: W. Ward. "Waiting for Love". with cleared funds. U.S. Currency Only. One example of this more serious work is The Problem We All Live With, which dealt with the issue of school racial integration. The painting depicts a young black girl, Ruby Bridges, flanked by white federal marshals, walking to school past a wall defaced by racist graffiti. When he was a child he developed his interest in art, beginning his artistic endeavors before leaving Poland. Much of the evolution in his work was related to his use of color and texture, with brighter and more vivid hues and contrasts. When she finally put paint onto paper, Kelly discovered a whole new world. Kelly hopes her work invokes a sense of clarity and peace inside of people as they walk their own path in life, and that it inspires them to discover their own limitlessness. August, 1913. This is a 1983 professional reproduction of an early 1900s Magazine Cover by Harmony Books. LOVE SONGS. April, 1928. This is a 1983 professional reproduction of an early 1900s Magazine Cover by Harmony Books. Reverse side is blank. September, 1914. This is a 1983 professional reproduction of an early 1900s Magazine Cover by Harmony Books. THE PROMISE OF AUTUMN. September, 1919. This is a 1983 professional reproduction of an early 1900s Magazine Cover by Harmony Books. Reverse side is blank. July, 1910. This is a 1983 professional reproduction of an early 1900s Magazine Cover by Harmony Books. Reverse side is blank. Using the crystalline properties of resin, he has replicated deeply hand-cut art glass. This work confronts the viewer with the beauty and drama of the sculpture's almost lifelike presence. 7½"Wx3½"Dx11½"H. 8 lbs. It is from Japan and even has Japanese writing on it. A thin wisp of smoke trails off into the lights of a harbor city.". This is a beautiful piece of art. It is made by an unknown artist with fabric and marker.